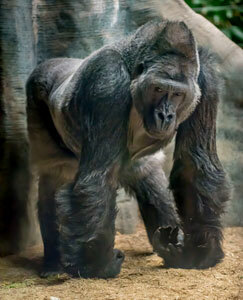 The Milwaukee County Zoo regrets to announce the death of one of its male gorillas, Cassius. 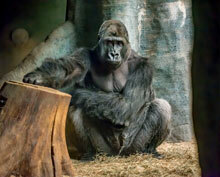 Cassius was 31 years old; born at the Gladys Porter Zoo in Brownsville, Texas, arriving at the Milwaukee County Zoo in 1998. He died during the night of April 12. The exact cause of death is not known at this time. For the past day and a half, Cassius was not interested in food or water. Significant concerns arise when having to immobilize great ape species, so keepers and animal care staff first observed Cassius closely, in the hope of being able to administer medication orally. If the animal is non-compliant, then immobilization is the next course of action. Cassius underwent an exam the morning of April 12, and veterinarians performed a cardiac ultrasound, electrocardiogram and a blood draw. Immediate findings indicated decreased liver and kidney function and that the heart may not have been contracting fully. He was slowly recovering from the anesthesia and staff continued to monitor him; unfortunately he died overnight. Results of a microscopic exam, and additional lab work will be forthcoming in the next few weeks. Cassius was the father to the most recent gorilla baby born at the Zoo, Zahra, and was part of the family group consisting of Zahra’s mother, Naku, female, Shalia, and youngster, Sulaiman. The family group is being monitored closely by keeper staff and will remain off exhibit for some time. Within the familial structure, the father is considered the leader, and provides direction to the group.